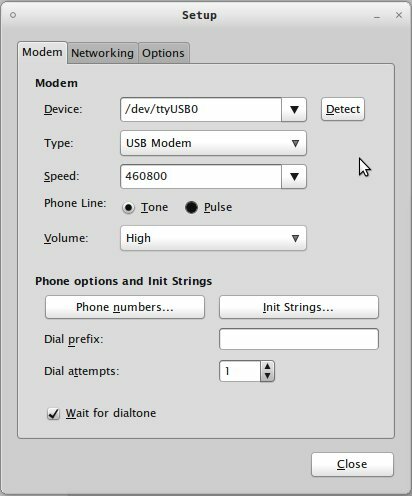 How to connect USB modem using Gnome PPP - There's some method to connect internet using USB modem on Kali likes wvdial, sakis3g, Gnome PPP and many others. This post will guide you how to install and setup Gnome PPP on Kali Linux. If you using wvdial, you must configure it via CLI ( Command Line Interface ), but not when you using Gnome PPP. Yes, this application is running in GUI ( Graphic User Interface ). So you'll be easy to configure it. Gnome PPP is a modem dial-up tool designed to integrate nicely into Gnome 2 Desktop Environment. GNOME PPP is very similar to GPPP dial-up utility for Gnome 1 and KDE equivalent, KPPP. KPPP. Since it is a graphical fronted for excellent wvdial, very little knowledge is needed to setup dial-up connection using this application. It features ease of use, auto detection of your modem and connection monitoring. The installing process will start and displays on your terminal. Just wait until it clear and finish. If you already connected, Gnome PPP will tell "Connected" with Running Time, Details and Disconnect button. That's all I can write about How to install, setup and configure Gnome PPP as alternate connect USB modem on Kali Linux. Hope you've enjoyed reading this tutorial as much I’ve enjoyed writing it. Thanks for visiting us.